Save Trestles: BREAKING NEWS - CCC Says Toll Road Will Impact Surf Break! is the finding by the coastal commission a positive or negative thing? does the fact that the cobblestone delta will be effected create a situation where the CCC may have grounds to enforce a section of the California Coastal Act that would protect Trestles? The most frustrating aspect of any environmental issue such as this, and the biggest challenge to those of us who want to quash this project, is the incremental damage that will occur as a result of the precedent of the 241 extension. I don't know the best tactics to fight this is, but maybe we should meet our critics on the ground that we are in fact "anti-development", because the Toll Road itself is only part of the issue. The giant elephant in the room is not just the road itself, but the development that is surely planned to follow. Look at the other Toll Roads the TCA built in the area, and the sprawl not just that they encouraged, but were in fact constructed to facilitate. This in its entirety is what surely threatens our sacred Trestles. I used to work for a Southern California County Planning commission, and I saw first-hand that this is what developers do. They slowly chip away at city and county zoning laws, each increment not posing a catastrophic effect, but in their entirity do without a doubt. People who oppose each project are easily beat on grounds that each change poses some "minimal" effect. They throw out words like "mitigate", land they set aside that will go after later. They count on the citizens to slowly become numb to each small change made, thereby succeeding in their plan. Is there a "they" behind this? I'm sure there must be. Ever wonder why every new suburb in Southern California has the same shopping centers with the same (publicly traded) super-stores? Is there a tie-in with the fact the TCA answers to powers on Wall Street? I guarantee, somewhere there exists a master plan for this entire undeveloped basin, and it includes shopping malls, track homes and more roads with storm drains leading right out into our surf break. And who is this Dave Skelly character? If you haven't seen it, go to youtube and watch this "Coastal Engineer" discuss how the road poses no threat to the sediment flow to Trestles. After doing some research, I found out this is a person who has been involved with the Surfrider Foundation and has been called an Environmental Activist. He's using some hack science to tell us what we all know intuitively and through common sense is wrong. That surfers need to be "leaders". I hate to see there is such a misguided, or dishonest person amongst the surfing community that would want to misguide us. All I have to say is, look at what happened along the other toll roads. There lies our answers, and there lies our best argument. California Coastal Commissioners JUST DENIED THE PROJECT!!!!! 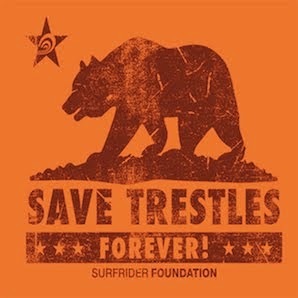 I just wanted to THANK YOU and the commissioners for the meeting held FEB 6 to save Trestles, San Mateo. As a resident of Anaheim hills and one who does comminute that direction and camp in that area for the last 40 years, nearly every weekend. I was there from 6am and got home around 2am. This was LONG DAY for us all. Please convey to all the commissioners my thanks and that they did the right thing for my family and the public. I hope some of the so called elected public official will take note of the turn out and the true feelings of the public. Thanks for saving our break and not letting the corporate world build on a state park ,what next a Yosemite toll road ? Like every surfer, today I am stoked by the Coastal Commissions decision. However, read what Terry's blog says. Developers have the money and all the time in the world. I am sure that they will appeal this decision. If not in the next 5 years, they figure, in the next 10. They can wait. They will wait and bid their time. Every surfer, hiker, camper, everyone who enjoys the beauty of San Onofre and environs should stand vigilant and aware. This area is hot property! There is much money to be made by building a toll road. And as the old saying goes, 'when money talks @!%#@&^% walks. So keep on your toes everybody. I do not think for a second that the TCA is going away any time soon. In the meantime, just today, I am stoked! What will their required qualifications be? Will Council approval be necessary for all these 16 people? How long will each person be at essaygrader job?